Good Evening! 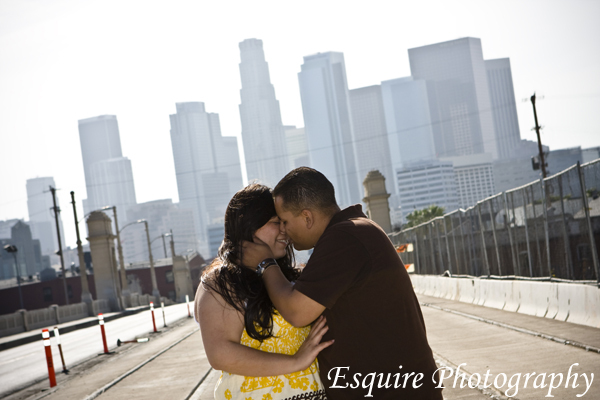 I just got in from spending some time in the world famous Downtown Los Angeles with Monique & Cesar. If there was ever a couple that was more willing to have a great time & spend the day laughing, I haven’t met them. Because we had a total B L A S T!!! Our day started off at Union Station. Monique had never been to downtown LA before – so this was a perfect start for her mini-tour of Los Angeles. We strolled around Union Station for tons of laughs and even more fun for some artistic and romantic photographs reminding them of New York City. After Union Station’s shootathon, we headed to the Dodger’s Stadium. Well, at least we were heading there, but there is so much development going on bringing downtown LA to become more of a city like NYC & Chicago, that we threw in the towel with all the detours & did an impromptu shoot on a bridge with the silhouette of downtown LA in the background. As were were shooting on the bridge over a train docking station, we popped under the bridge & got crazy around the mighty engines that were docked. To complete our day, we headed to The Edison in downtown. The last time my jaw hit the floor with such an opulent location was when I shot in various clubs and locations in Chicago & New York City. The Edison is a signature lounge alive with artifacts from it’s history as Downtown LA’s first private power plant; a celebration of an era of invention and imagination — the blending of science, art and industry. 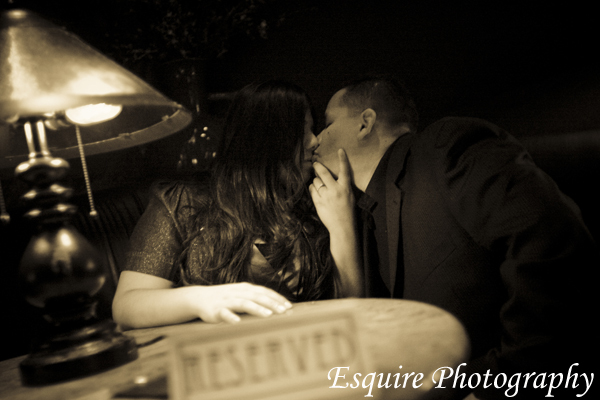 Mr. Tyler Dow; The Edison’s Assistant General Manager was extremely kind and gracious to allow us an hour to enter The Edison and do some of the more amazing, romantic photographs that I’ve been allowed to do with a couple in a long time. If you ever want “To have an evening you’ll never forget, and one that you can’t remember” – The Edison is perfect for your night out of cocktails and romance. 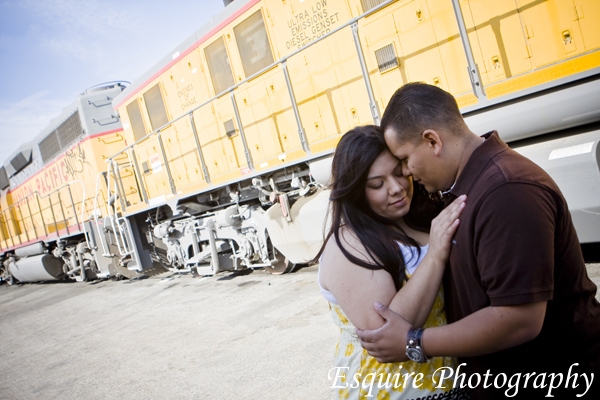 Our day was wonderful and I am so excited about spending their big day with them coming up in August! Here is a small sample of what I saw through my lens and I hope you enjoy them as much as I did photographing them – cheers!